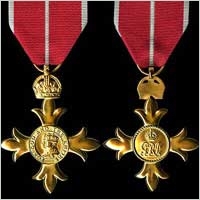 THE MOST EXCELLENT ORDER OF THE BRITISH EMPIRE.-OFFICER. A SUPERB QUALITY FULL-SIZE GILT FINISH REPLICA. IN MINT CONDITION AND AVAILABLE WITH RIBBON FOR EITHER MILITARY OR CIVIL DIVISION.